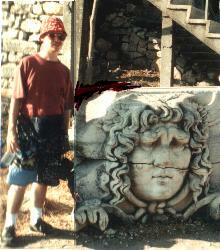 WEST TURKEY, AUGUST 1991 - Ruins of temples, castles and fortresses, amphitheatres, city walls,... hot, dry and remote places. Some of these places used to be ports in Greek times. We visited the site of the historical Troy - basically only city walls are left, and you need to be an expert to see all the different layers - the acropolis and fortress in Bergama (Pergamon), Pirene, Didymea, Efes... the array of interesting sites is large - some of them no more than a collection of stones, others well preserved and restored... 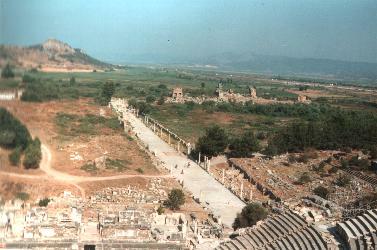 It is a travel through Greek and Roman culture. I also remember that often we were the only tourists around, and on the bus, mostly overcrowed by locals - the bus stopped everywhere - the landscapes were always great and the farmers still used mules and horses.